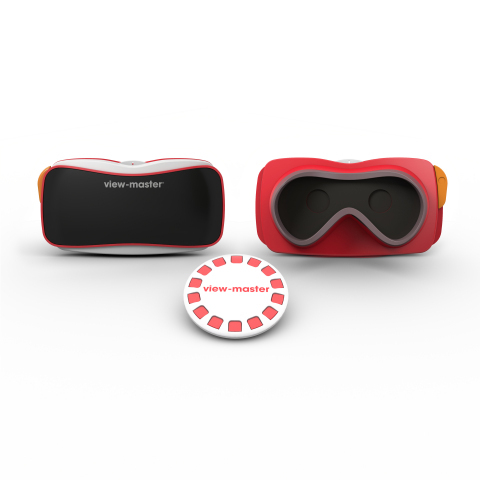 Mattel Collaborates with Google to Reimagine the Iconic View-Master Toy | Mattel, Inc.
NEW YORK--(BUSINESS WIRE)-- Kicking off the Toy Industry Association's Toy Fair in New York today, Mattel, Inc. (NASDAQ: MAT) unveiled a collaboration with Google that gives the iconic View-Master toy a 21st century twist. With the new View-Master that works with Google Cardboard, Mattel is infusing its expertise in fun and play to develop an immersive digital experience for kids. Mattel's new View-Master offers an easy-to-use and affordable platform that will enable users to take engaging field trips where they can explore famous places, landmarks, nature, planets and more in 360 degree ‘photospheres'. By pairing the View-Master's ‘experience reel' and app with an Android smartphone, kids will immediately experience an imaginative and interactive learning environment. "The View-Master was first introduced at the 1939 World's Fair in New York, giving consumers access to spectacular 3D worlds by simply selecting a reel and looking through a device," said Doug Wadleigh, SVP and Global Brand General Manager, Toy Box at Mattel. "By working with Google's Cardboard platform, we are now able to take that experience even further bringing the discovery and immersive viewing experience of the View-Master to the digital age. Combining technology and innovation with this classic toy gives kids an enhanced experience allowing for play opportunities not yet imagined through new, digitally curated content." "We developed Google Cardboard as an open platform to inspire companies like Mattel to rethink how to deliver new user experiences through technology," said Mike Jazayeri, Product Director for Google Cardboard. "Many of us on the Google Cardboard team grew up playing with View-Master, so we were excited to collaborate with Mattel and to see the viewer evolve and work with Google Cardboard." Available fall 2015, consumers can purchase the View-Master viewer and a sample experience reel for SRP $29.99. The sample reel (when paired with app and smartphone) provides a glimpse of the full View-Master experience, including a gallery of classic View-Master images, a journey into space with a tour inside a space shuttle, and a chance to explore a unique destination in 360 degrees. Additional experience reel packs will be sold separately at retail for SRP $14.99, and each pack will feature four themed experience reels - with themes such as nature, adventure destinations and science - and each experience reel will be loaded with multiple areas to explore. To continue to expand offerings on the View-Master platform Mattel will begin to curate and create new experience reels with other Google Cardboard developers to offer users even more unique content to enjoy. For more information on the View-Master product, and for licensing and developer opportunities on the View-Master platform please visit www.view-master.com.